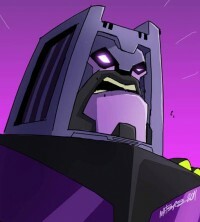 Want to watch BotCon 2011's Animated Motormaster come to life? The artist of this year's Botcon comic, Marcelo Matere, has uploaded a video to YouTube in which he draws Motormaster from start to finish as a warm up to working on the comic. The video is embedded below. That was so cool! I'm always amazed at the skill of these artists. I appreciate the effort and I know some good work went into this, but wouldn't it have been better to just post the picture? Fires_Of_Inferno wrote: I appreciate the effort and I know some good work went into this, but wouldn't it have been better to just post the picture? Better how exactly? not only is the picture included at the end, but you get to see the process as well! This video was awesome! imagine how much work is actually involved here, how much time! multiply this frame by however many per page by 22 pages and you've got a full freaking awesome comic. A lot of effort indeed. Pure awesome-sauce! I especially love how the optics are done, with the glowing bit! Great job, Mr. Matere! It's amazing what computers can do. I like the art but hated the annoying Japanese disco music in the backround. Rated X wrote: I like the art but hated the annoying Japanese disco music in the backround. Japanese disco music? it's Transformers Animated's japanese intro theme. Also, if you don't like it, just mute it. 4,857 pages were recently viewed by 687 unique visitors. This page was viewed 1 times on Friday, April 19th 2019 7:21am CDT. © 2019 Seibertron, Inc. DBA Seibertron.com. All Rights Reserved. Established June 2000. Seibertron.com is owned by Ryan Yzquierdo.